Quickly share content across devices. Push, copy and paste everything. 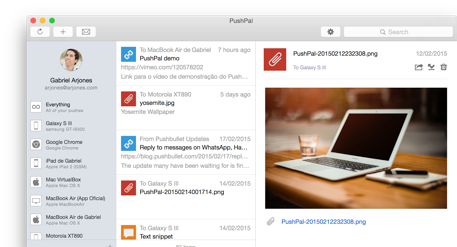 Mirror your notifications and start SMS conversations on your Mac. Easily share your screen (or a part of it) with other devices and friends.. Receive your phone notifications on your Mac and act on them. Seemlessly integrated. 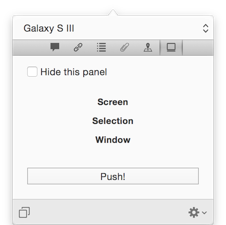 Conveniently available in the Mac OS X menu bar, sharing anything is always a breeze. Drag & drop or a few clicks and your're done. Access your data directly within PushPal. 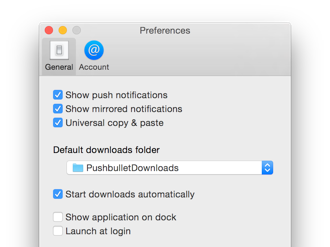 Send and delete pushes, add friends, rename or delete devices, (un)subscribe from Pushbullet channels. 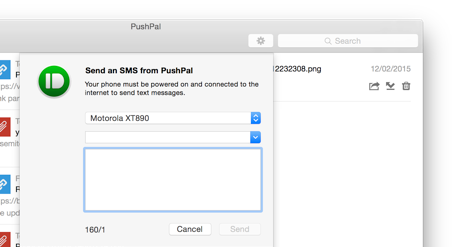 Start new SMS conversations right from your Mac. No need to reach out for your phone. Configure PushPal to fit your needs. Something missing? Want to request a feature? Drop us a line! Copyright (c) 2015 Gabriel Arjones. All rights reserved.